I have a lot of birthdays coming up so I've started making birthday cards! I think this one could be for a male or female, young or old. 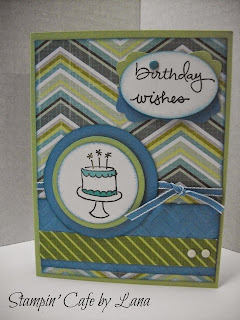 The stamp set is Endless Birthday Wishes from Stampin' Up! The cardstock, punches used, candy dots and ribbon are also from Stampin' Up!, but the patterned cardstock is Hopscotch from Colorbok. The color combinations in this card are my favorite so I enjoyed making it for whoever is going to be the recipient. I haven't decided yet. I'll be posting more birthday cards as I get them done. Thanks for looking!